TO PURCHASE NOW, CLICK HERE. Under an oath to serve and protect, Driscoll Parks has saved lives–but there were others. Ones he couldn’t save. And when the past invades his present, sleep becomes a secret world where his memories take the form of nightmares and where his demons come out to play. The lines of reality begin to blur when he discovers he is losing his greatest battle–the battle to protect his family. Alex tries valiantly to support her husband, her hero. But sometimes, even heroes get bloodied in battle. How can she help him when all she sees now is an angry and tortured soul? 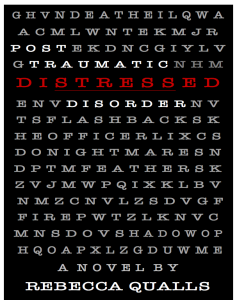 Distressed, takes you on an emotional journey inside the life of a family whose struggle with Post Traumatic Stress Disorder endangers all they have worked so hard to build.